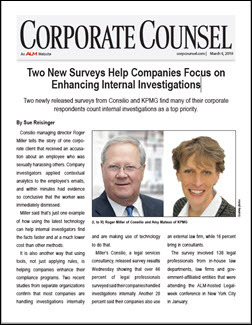 Two newly released surveys from Consilio and KPMG find many of their corporate respondents count internal investigations as a top priority. Consilio managing director Roger Miller tells the story of one corporate client that received an accusation about an employee who was sexually harassing others. Company investigators applied contextual analytics to the employee’s emails, and within minutes had evidence so conclusive that the worker was mmediately dismissed. Miller said that’s just one example of how using the latest technology can help internal investigators find the facts faster and at a much lower cost than other methods. This article was originally published by CorpCounsel.com on March 6, 2019.